Kylie Jenner seems to have taken well to being a first-time parent. 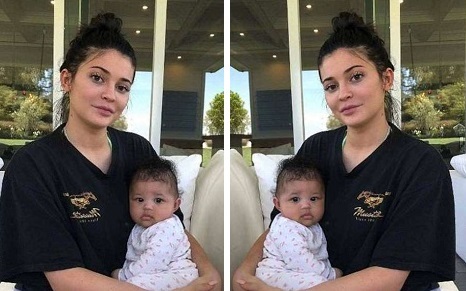 In her latest images, the 20-year-old Kylie Cosmetics founder has looked more relaxed than ever as she cradles the little bundle of joy that she welcomed with rapper Travis Scott. And on Wednesday another lovely portrait surfaced on social media as Kylie sat in a white chair with the baby - who turned four months only on Friday - in her arms. Kylie had her raven locks in a top knot and she was wearing a black T-shirt with Mustang written in gold on the side. It appeared she had a swimsuit on underneath. The daughter of Kris Jenner, 62, had on no makeup, not even a hint of lip gloss. Little Stormi wore a pink and white print top and leggings. Her expression was serious as if she had just woken up from a nap. » Did Caitlyn Jenner Just Let It Slip That Kylie Jenner Has Already Given Birth?